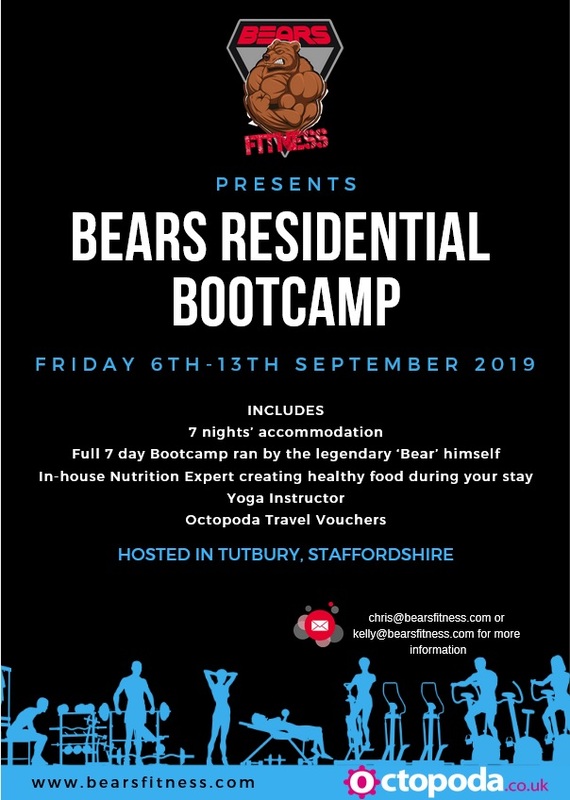 The team at Bears Fitness are running an extensive bootcamp in Tutbury, Staffordshire from Friday 9th September to Friday 13th September 2019. The venue stands in the historic grounds of Tutbury Castle in a fantastic elevated position above the village of Tutbury, Staffordshire on the banks of the River Dove. Over the course of the 7 days, the team will have an in-house nutrition expert, a chef who will conjure up some deliciously healthy and tasty foods during your stay, a fabulously bendy yoga instructor and a host of elite Bootcamp trainers including the legendary ‘Bear’ himself. To receive more information and pricing you can contact the team at Octopoda, Bears Fitness via chris@bearsfitness.com or kelly@bearsfitness.com or to speak to one of the Bears Fitness team direct, simply call (07583) 003670 and they’ll be on hand to answer all questions you have.